Threat actors increasingly look toward illicit cryptomining as an easy source of income. Cryptomining is the production of virtual currency, also known as cryptocurrency, such as Bitcoin and Monero. It comes at the expense of system performance and power consumption. Moreover, threat actors are infiltrating networks to use their victims’ computer resources to do this work for them. 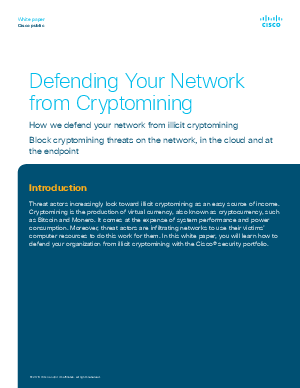 In this white paper, you will learn how to defend your organization from illicit cryptomining with the Cisco® security portfolio.